It is natural to want to believe that we can deal with whatever life throws our way, but the truth is that sometimes it can feel just too much. Negative thoughts which we have previously kept under control can begin to get "louder" and in some cases seem overwhelming and contribute to a feeling of isolation. I can help to lessen that feeling of isolation and work with you to find the best way forward so you can get back on with your life again. I am originally from Newcastle, moving to York in 1987. I have worked as a qualified counsellor since 2003 and am a Senior Accredited Member of the British Association for Counsellors and Psychotherapists. Although not far from the centre of York, it offers plenty of free parking and the Rawcliffe Park and Ride(number 2) is only a short walk away. If you are travelling by train the number 2 bus stop is 2 minutes walk from the station. I believe that everyone is different and work with my clients as individuals. What works for one person may not necessarily work for another. My integrative approach enables me to tailor the way I work to suit each client. I work from a humanistic base, but also have a certificate in CBT for clients who prefer a more structured way of working. 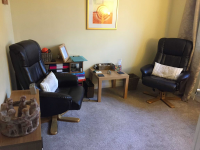 Although I have 14 years experience of working with a wide range of issues, I do have a special interest and extensive training in working with stress,anxiety, trauma and PTSD. I am a EMDR (Eye Movement Desensitisation and Reprocessing) Europe Accredited Practitioner. I have found EMDR to be an extremely effective method of treatment for anxiety, trauma and PTSD. It works by harnessing our natural problem solving ability. Sometimes it can be very difficult to talk about what makes us anxious. Unlike counselling, EMDR can work effectively without the need to go into the detail. I enjoy working with my clients, helping them to rediscover strengths and to identify areas that might require the development of new resources, which we can work towards together. Anxiety; Trauma; Post traumatic stress disorder; Adult individual therapy; Humanistic; Integrative counselling; CBT; Psychodynamic; Relationship; Bereavement; Loss; Depression; Stress; Sexual abuse; Phobias; Self esteem; Anger; Work issues, Bullying, Relaxation; Life changing events e.g. illness, redundancy; Miscarriage; Dissociation; Emotional/physical abuse; Infertility; Low self confidence; OCD, Self harm; Separation and divorce. I am a member of the British Association for Counselling and Psychotherapy, UKRCP Registered, and a member of the EMDR Association.